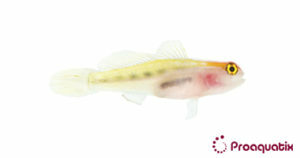 A translucent goby with a red head and many ornate markings. Three black lines originate from the head and run longitudinally along each side of the body, sometimes appearing to be faded. The most dorsal pairs of these lines are usually unbroken near the head and fade away near the midpoint of the body. The next ventral series of these lines often appear as a line of broken broad dots that end near the caudal peduncle. The most ventral series of these black lines only appear as two large faded blotches on the abdomen. Meanwhile, three distinct reflective yellow stripes are located between the four most dorsal black lines. Two reflective blue stripes also appear between the four most ventral black lines. In addition, each eye is highlighted by two vertical reflective yellow stripes, posterior and anterior to the pupils. This species lives among the spines of the pencil urchin Eucidaris thouarsii for protection against predators. Tropical Pacific coast of North America. These gobies are conspicuously present near their favorite crevice. These gobies are relatively immune from predators when among the spines of a host urchin and they exhibit the same conspicuous presence when perched near their rock retreat.